Anders Behring Breivik is suspect in massacre of over 80 at Labour Party Youth camp on Norwegian island and downtown Oslo bombing. Breivik is being called a Christian fundamentalist even though he was a Freemason and supporter of such vile Zionist Islamophobes as Pam Geller and Richard Pipes. Pipes and Geller are ciphers for Israeli intelligence and propaganda elements and provide a clear link between Breivik and Mossad, which is under orders to stage false flag attacks to garner support for Israel against Palestine, Cyprus and Norway being the two most recent examples of Mossad-staged attacks. 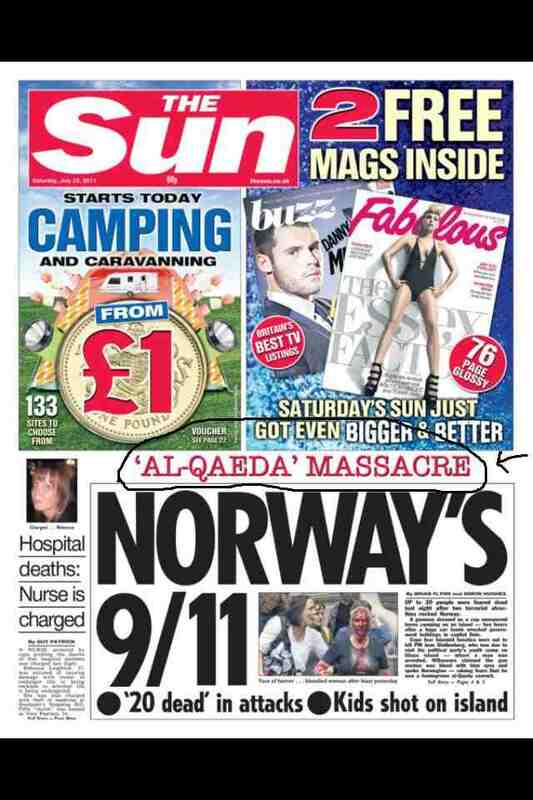 With death toll now over 90, Breivik not alone in attack. Police investigating second shooter. Obama administration covers up for Israel by calling attack “domestic.” With ample evidence of Mossad involvement in Oslo, it is up to every one of us to report to the Nth degree any suspicious contacts with Israelis or Israeli sympathizers. Because our police forces in America, New Zealand, Norway, Britain, Sweden, Denmark, France, Canada, Australia and elsewhere are infiltrated with Mossad sayanim, katsas, and jumper katsas, we must take it upon ourselves to expose these agents, publicize their names, turn the disinfectant of sunshine on their subterranean operations, and generally, make life miserable for them. WMR editor is the godson of Norwegian god-parents from Trondheim and Israel and Mossad have now made their viciousness intensely personal. Tillid ingen israelske!